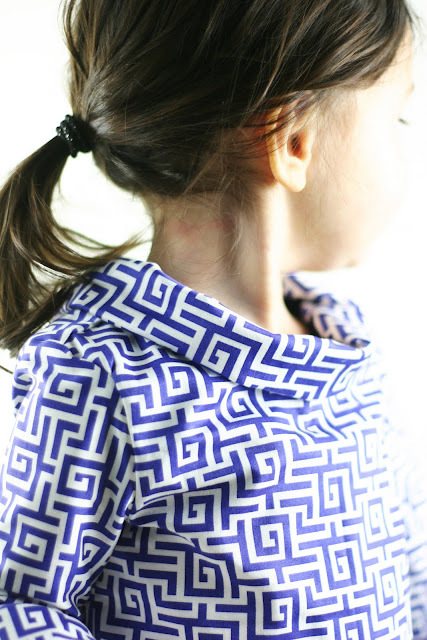 Grosgrain: Estate Sale Blue Blouse GROSGRAIN GIVEAWAY!!!! CLOSED. Estate Sale Blue Blouse GROSGRAIN GIVEAWAY!!!! CLOSED. I saw this fabric at the JoAnns and couldn't resist. It was my favorite color, cornflower blue or "estate sale" blue. At the time, I wasn't quite sure what I was going to do with it but I knew that whatever it was it would be modern and stylish. Since, I had no intention of making another maternity dress I opted for a top for Molly. Plus the fabric was kind of expensive so I could only afford one yard. 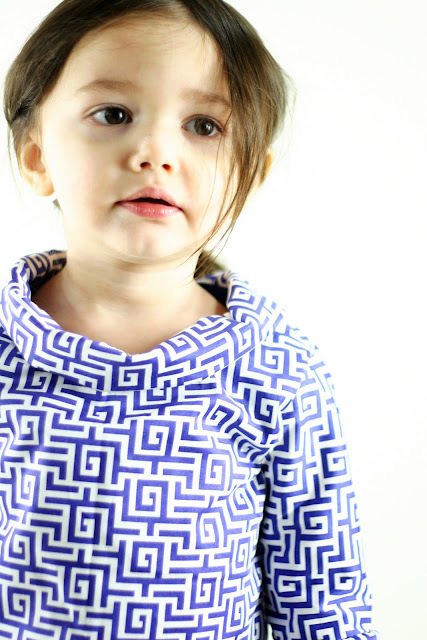 The collar of this top can be worn either up or down. When worn up the look is very couth. In the photos it is folded down. The back of this blouse has one wood colored button at the top so it is open down the back, sort of like a smock. I put a white ballerina's leotard on Molly underneath the blouse. You may not be able to tell from the photos but the bottom of the sleeves are bell shaped with a small gather below the elbow. The pattern and cropped look seemed very 'french' to me. I imagined if I went to Paris I'd see little toddlers carrying red balloons in tops like this. I wish I had taken more pictures of her shoes. 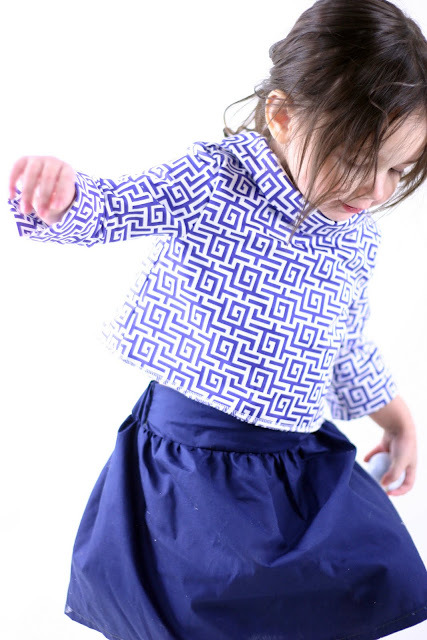 They were just perfect for this little outfit, navy blue with little white bows and white trim. I bought them at the Salvation Army but originally they were from Baby Gap. Since they are dressy, with the cold weather I haven't had much of a reason to have her wear them but they were quite a thrift store find! Molly enjoyed dancing in the little top and jumping up and down which caused her hair to come undone. I tried to pull it back in a cute little ponytail but her bangs kept falling in her eyes. Her hair is in this in between stage where there is almost nothing I can do to make it look neat. I might break down and have her bangs cut but I'd like to try and keep everything long. Some people said it looks sort of like a backwards jacket and I happily agree! I think I've subconsciously always liked the look of backwards painting smocks. I couldn't quite put my finger on it but there it is! I should have called it the Petite French Painter's Smock Blouse. You may have noticed that my posting has become a little sparse at times. I still manage to post every weekday but obviously I'm very close to the end of this pregnancy. I could not be happier! I'm super uncomfortable in many, many ways. I don't remember being this uncomfortable with either of my other two children. I'm actually looking forward to post-surgery. Speaking of that, I am scheduled for a c-section next Thursday. So for a while I will be recovering. But I will try to be scheduling posts in that time so please stop by for sewing and fashion goodness. This blouse is beautiful. Count me in, please! This is so cute...love it! Totally cute and oh my goodness, next Thursday??? I knew it must be coming up soon but I didn't realize how soon. Guess I won't be seeing you at MOMents for a bit. I'd love to bring you a meal if you'd like! Blessings!!! OOOOO!!! I entered!! I love it!! This is an amazingly adorable top. Best of luck for next Thursday! adorable. best of luck next thursday. Hope all goes well on Thursday! Linked to my blog! Good luck with your c-section! Congratulations in advance! C'est tres chic! Count me in for this one!!! please count me in! it's such a cute top! also now knowing that you are having your baby next week, i must tell you that you look so good in your betty draper dress. i was looking pretty swollen by that point. good luck with the delivery and recovery! This is the first time I have ever left a comment...I am just getting my own blog started and am learning to sew. I love your blog and hope that some day I will have one up and running that is equally inspirational! Thanks for that, and hopefully I will win a give away some day. Hope the C surgery goes well. My girl would love that top! Or at least I would love her in it! My Bethany would love how girly this set is......and we are excited for you to get to meet your little one! I loved this one. The fabric and the style. I am hopeful but I never won one of this thigs. How lovely! Yes, you are absolutely right about this being perfect for Paris! My 2.5 year-old would look darling in this. And, best of luck for Thursday! I bet you and your family are exctied to finally meet the newest little addition -- and, she is bound to be super adorable just like the other two! Congrats! How pretty! I would love a chance to win! I love this! It almost looks like it can be turned around and worn as a jacket too. I love love love your design! Brilliant! oh! MY first giveaway entry! this is adorable! Good luck with your delivery! Good luck with your c section! I know how it feels to be so uncomfortably pregnant! I'm so impressed with your designing skills. 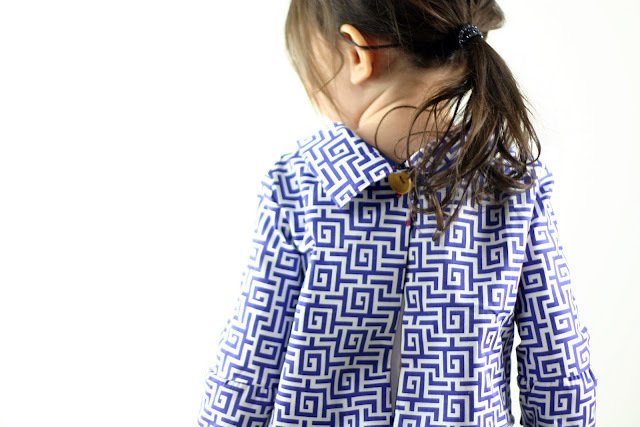 Adorable and perfect for the chic toddler! This is SOOO cute! I love it--you do amazing work ! I linked. And I really love this shirt and the color is great. That is so beautiful! I love that rich blue. I also created a link on my blog. 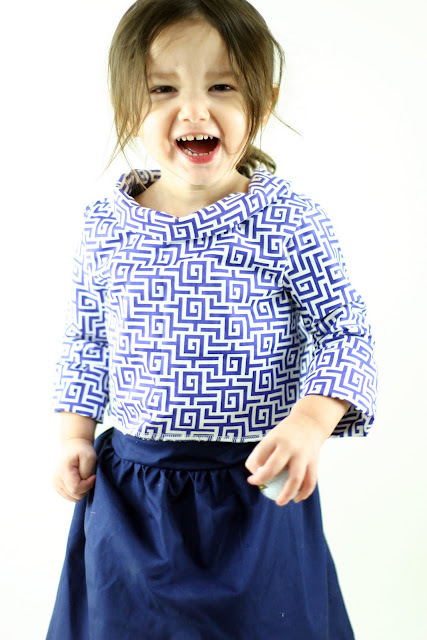 This is THE most adorable little lady's blouse I have ever laid eyes on! Thanks for such a great little giveaway! Best of luck with your new little love! I never know if I ever do this right. However, I would love love LOVE to see this on my daughter. SO CUTE!! I love it!! Linked! you have always so inspiring ideas, thank you love it.And good luck for thursday!! this would look darling on my granddaughter! This is so cute!!! I ♥ it!!! Please count me in the giveaway!! Oh, How I would love to have this for my nina! So cute! God Bless and all the best for your delivery! Oh my I am in love with this outfit! Aww...so adorable!! My little girl would look great in this! Aww...it's so adorable! My little girl would look so cute in this!! Aww...so adorable!! My little girl would look so cute in this! My little girl would look so cute in this! so so so cute, and how perfect seeing as how i live in france to have a french painters smock! sew cute! thanks for 2 chances to win!! I love this shirt, and think it would look lovely on my blue-eyed Esther. so cute! i love that blue -- especially paired with the yellow button. I love, love, love this top! Will you post a tutorial on how to make it? Perfect, perfect. Shape, fabric - everything is great.